Medical Alert Wallets strives to provide the best products and service to our customers. We take great pride in our company and believe you will get that extra feeling of Safety and Security by having a Medical Alert Wallet on you. We hope that you will have a better chance of an early diagnose, on the spot, if possible, with the Medical symbol and the Medical Information Card that you have put your current medical information on. 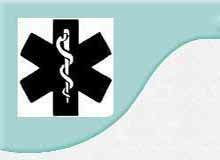 Medical Alert Wallets provides top-notch quality wallets with a Medical symbol and each Medical Wallet comes with a Medical Information Card, for you to fill out. Medical Alert Wallets hopes anyone wearing or carrying a Medical Wallet will not need medical assistance, but if something does happen to someone, we hope that the Medical Wallet and the Medical Information Card will help all Medical Response Teams diagnose your problem and get you the correct help right there, on the spot, if possible and not have to wait until you get to a hospital. All people who have allergies, medical conditions and/or take medicines should have the medical symbol on them. What a better way to do just that then to have it on a wallet, next to your identification and the Medical Information Card you filled out. You'll get a good quality wallet and have a better feeling of Safety and Security. A must for people in Rehabilitation, Physical Therapy, Assisted Living and all ages, young and old. After Rehabilitation and Physical Therapy you will still be taking medications and it is safer to carry one of our wallets on you, in case of an emergency or not. Even if you are not buying anything at least see how to get a Medical Information Card on our Contact Us page. Remember if you have any allergies (especially to drugs), medical conditions and/or take medicines then you need a Medical Information Card on you at all times. We do not send repeated solicitations to our customers or people requesting a Medical Information Card. Simple No Hassle Return Policy, if for some reason you do not like the Medical Alert Wallet/s you purchased from us, just notify us by email us at sales@MedicalAlertWallets (dot) com or on the Contact Us page, and then send the wallet/s back unused and after we receive it and inspect it, we will send you your money back, minus any PayPal fees. Oh and you can keep the few Medical Information Cards we sent with the wallet/s as a gift from us. For more information regarding our Return Policy, please go to our Policies & Terms page. PayPal Checkout, our online store is designed to provide a smooth shopping experience. To ensure you'll feel secure when placing orders online, we use PayPal for all our transactions. PayPal is a secure web site with SSL (Secure Socket Layer), making your experience the safest and easiest possible. Note; If you are already a PayPal member you will automatically be recognized, making your shopping even faster. If you do not have a PayPal account then you have two (2) choices, to go directly to Check Out without joining PayPal or you can choose to join PayPal while in the process of Check Out. PayPal is used on millions of web sites. So joining PayPal would only make your payment process easier and faster on future purchases at any web site that has PayPal. Without having to fill in numerous lines of information at every web site you buy things, all your information comes up automatically, making Check Out process easier and faster. If for some reason you do not want to use PayPal, please go to print order form page click here or Please notify us and we can arrange another way of payment. Shipping and handling within the United States is cheap, for Canada and International S&H info please read here. Companies, Groups and Organizations with orders please Contact Us for availability, pricing and shipping info of products. 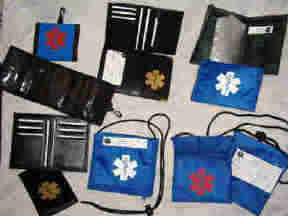 Thank you for visiting and shopping at Medical Alert Wallets.